We train in basic gym gear; t-shirt, shorts/ track pants, and trainers. We will be grabbing one another so there is a slight risk that your clothing may tear, so you may want to wear your older gym gear to training. Groin guards are a must. Krav Maga actively encourages strikes to the groin so protection here is needed to train throughly in Krav Maga. Groin guards can generally be picked up from a martial arts store. Ideally you want one that you can wear on the outside as it’s easier to wear for training. 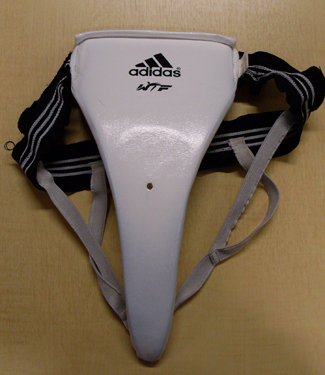 Also try to find one that is fully padded from the waist band to the groin, as it affords extra protection. Avoid those that are steel enforced, though they may sound stronger, they hurt more with a direct strike. 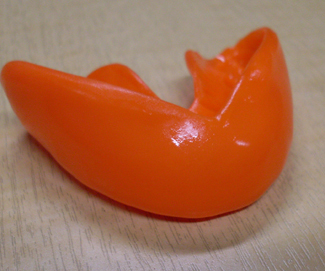 You can pick up a mouth guard from your local chemist, from a sports store or get one custom fitted. We don’t actively encourage strikes to the head but accidents can happen as with most contact sports, so it’s better to be safe then sorry. Hand wraps or hand protection are optional but highly recommended. This is because as you get tired you tend to scrap your knuckles against the pads, and unfortunately they take a while to heal. So again, prevention is better here as well. Hand wraps can be picked up from a general sports store or from a martial arts store. Ladies, you may want to pick up a chest guard as there will be strikes to the chest. This is totally optional and for your comfort. Once you’ve been training a while and want to push your training further you may want to look into buying further gear. With this gear you’ll be able to have more contact sparring and the determination drills will increase in intensity but you will still be safe. We don’t hold or sell any gear so shop around. The following links can help you shop for your gear to get you started. (Please note that we are not affliated with thse companies. The links are just suggestions to help you get started). 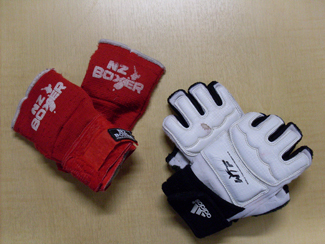 NZ Boxer – good stockist for most of the gear with the exception of groin guards.